Have you noticed heel pain now that you’ve started a new walking regimen or exercise program? Does it hurt when you tried to take a couple of steps in the morning or after resting for a period of time? 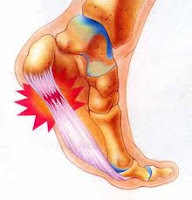 You may have plantar fasciitis! Inflammation of the band of tissue called the plantar fascia can cause heel pain or arch pain. The plantar fascia is a thin fibrous band that connects to your heel bone and goes through your arch to support the whole bottom of your foot. It is like a large strong ligament and is prone to stress with activities when coming down on your feet. The good news is that most plantar fasciitis cases need only conservative treatment to resolve, but be advised…do not try this alone! Call Advanced Podiatry about your heel pain at 813-875-0555. The longer heel pain lingers, the harder it is to treat! At Advanced Podiatry we have treatment options for every age or activity level to treat plantar fasciitis!